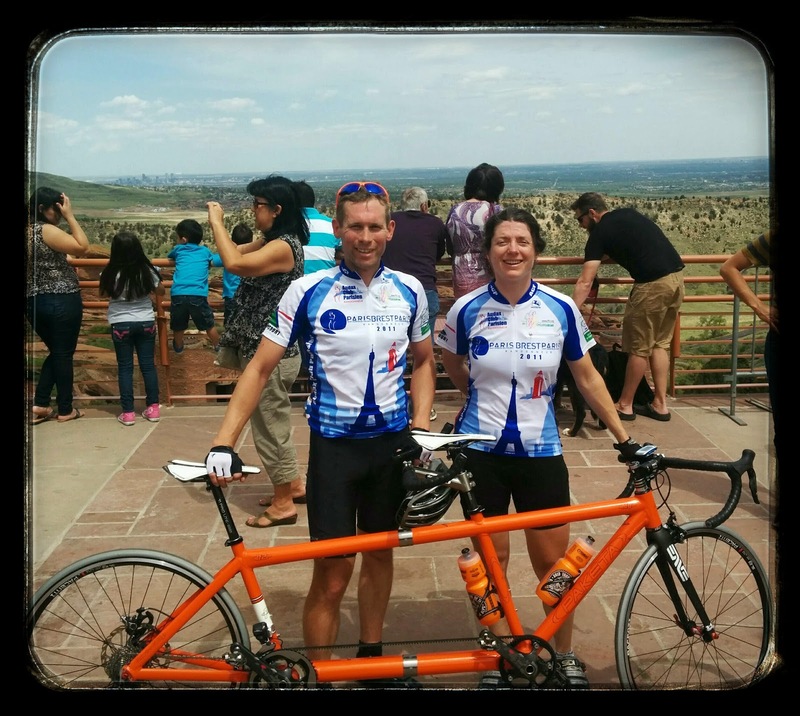 Last weekend we collected our new Paketa tandem, as we mentioned over on Facebook. While flying back from Colorado I jotted down some of the thinking we'd been going over in the prior months that led to this new addition to the Tandem Thing stable. The original requirement on getting a new tandem was a fairly simple single item: it must have couplers. We already have two fantastic machines in Dobbin and Katina, which cover a wide range of needs from adventure touring through to fast randonneuring respectively, but for various reasons (primarily: we never anticipated living in USA) neither came equipped with couplers to dismantle for travel. While we'd taken steel framed Dobbin on a number of flights, checked into the aircraft hold whole, we'd always found it a harrowing experience, and never dared contemplate doing this with our carbon tubed Beyond. In London we had plenty of Europe within a day's drive or train journey; even Paris-Brest-Paris was a day and a night's cycle from our door. But the USA is big. Really big. While the locals don't flinch at the thought of 20 hour drives, we're not in that mindset yet. And besides we'd also like to do some more brevet rides overseas at some point, so having a faster rando bike we could fly with in a more serene state of mind was our goal. Jay, our RAAM team crew chief, first pointed us in the direction of Paketa, and two of our co-teams already owning Paketa tandems, it was an obvious choice to investigate further. The first thing we found on contacting them was how open and responsive they were to our somewhat unusual requests. As we already had 2 extremely enjoyable and highly reliable rides, we decided to take some balanced risks with this one and see what we could achieve embracing the latest tandem technology and designs -- quite appropriately, given Paketa build frames exclusively from Magnesium tubing. 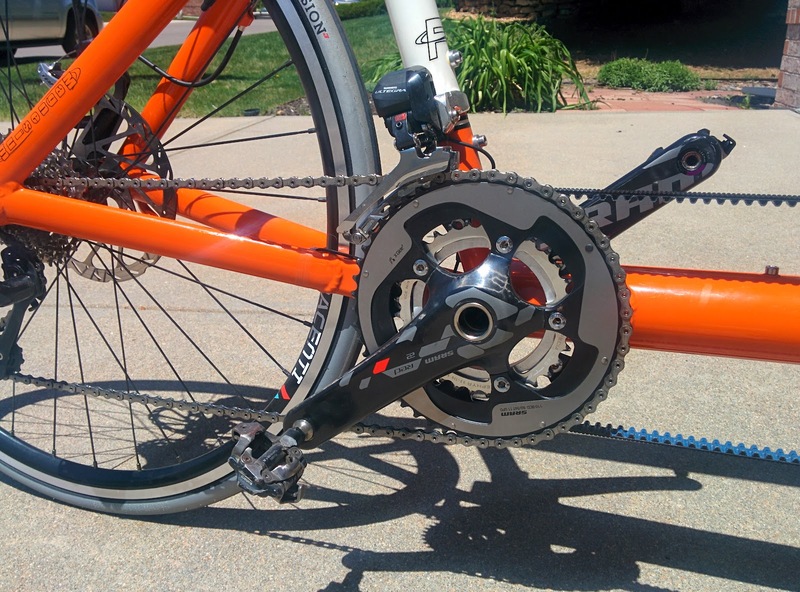 First up was switching to a Gates Carbon drive belt for the sync "chain". 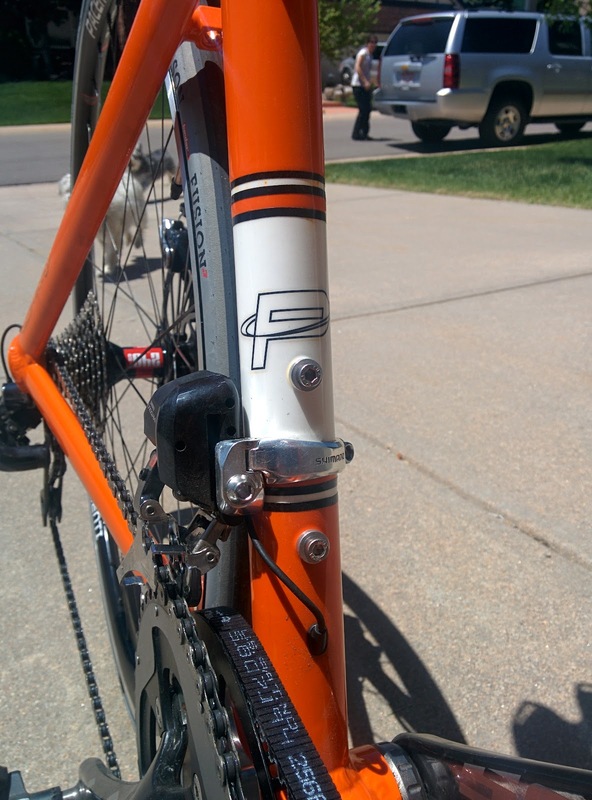 Paketa have developed a innovative adapter to allow the belt to run on the right-hand side of the frame. 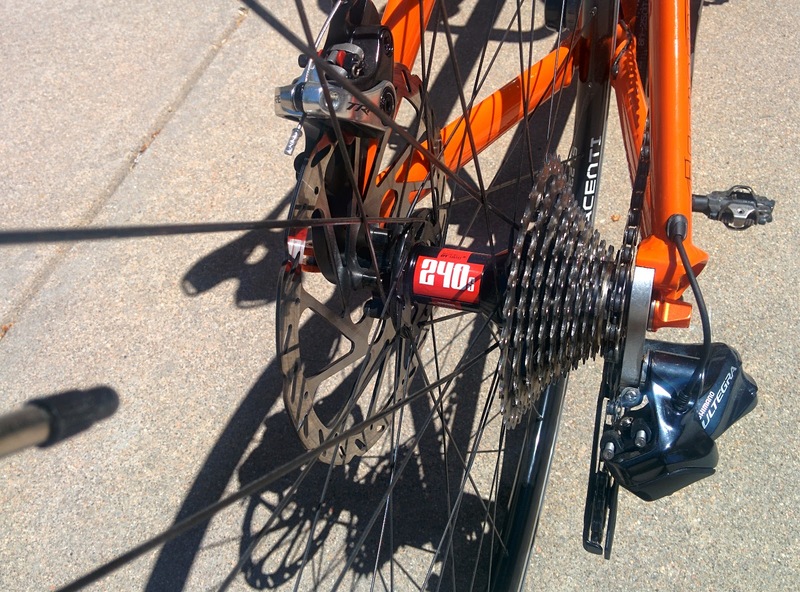 This decreases weight and improves power transfer through the the drive wheel: less frame flex, and less torque across the rear bottom bracket. Having already become used to the "direct drive" (albeit with a traditional chain) on our Thorn, Dobbin, this was a natural choice for us to go for. Next is the groupset proper: we'd had an inkling towards electronic shifting after reading numerous reports on the interwebs about how well it can work on a tandem. Then on the gold-rush 1200km last year, I had found numerous stretches of road where I wanted to stay on the aerobars, and a couple where I really wanted to stay up on the tops, but in neither place could I shift gear and so ended up pushing some horribly inappropriate gear by default. Electronic shifting with Shimano Di2 opens the possibility of multiple control positions, and so this sealed the deal in my mind. Only snag was that the most popular tandem Di2 groupset is the Dura-Ace 7970 series, as it has various adaptations available to expand to the widest range of gears possible, however that is not compatible with the readily available extension shifters as it pre-dates the newer Shimano "e-tube" standard for interconnecting components. So decision time: keep with the older (obsolete) technology, or buy into the new and compromise on gear range. As our theme on this tandem was embracing the new tech, there was only one choice: go with e-tube and hope we're strong enough for the gearing options available! With the newest Ultergra rear mech, we can get a low gear of 33x32 which is looking good enough so far for all but the silly steepest climbs. Also a risk will be the 50x11 top gear will have us spinning out too readily and become a limiting factor on improving our overall moving average. At least by buying into the newest tech, we have the best chance of being able to make incremental upgrades as new options become available. 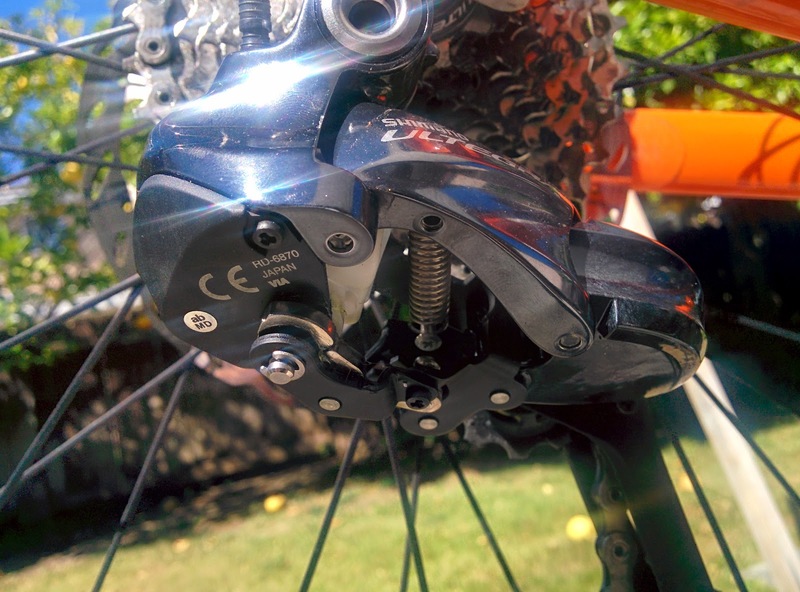 The long rumored XTR Di2 groupset would make a world of difference for our setup: if any Shimano reps are reading and would like a test-team for the XTR rear derailleur, we'd love to help you out! The third theme for our new bike turned out to be weight-reduction. We'd never thought too long on this before: certainly in touring and a large part in rando we just accepted the sum of the weight of the stuff we felt we needed on the road was the weight we were destined to carry. Weight saving implied cutting back on food or clothes, and (especially in English weather) we were reluctant to cut corners on either those. Buying a Magnesium tandem, while simultaneously working hard to loose kgs from your own body weight, puts you in a much sharper mind for finding weight savings though. The single best number for predicting a cyclist's potential is look at their power:weight ratio, and so it's obvious why cyclists obsess so much on this point, even if your primary goal is not all-out hill climbing. Getting a "coupled" travel tandem is generally contraindicated for weight-weeny wins, as (depending on specifications) the couplers add over a pound of extra metal, so we knew we were setting out from an awkward starting point. However Paketa have previous made a sub-25 pound travel tandem so this gave us hope we could make a competitive build. Lighter weight wheels, seat-posts, and the electronic shifting all help keep the grams off. And in particular for short (sub century) ride days, we even splurged out on a pair of "S-Works Toupe" saddles: 115 grams of weight reduction joy. At this point we've stuck with more weighty but tried-and-tested aluminium handlebars, XTR pedals, and a big (200mm) rear disc brake. For those we have some weight reduction plans or alternative configurations in the works, so our current all up weight of 27 pounds maybe one we can push downwards, if needed. (I had predicted 26.5 pounds prior to the build by taking the sum of component weights, so was pretty pleased not to be way off mark with that). 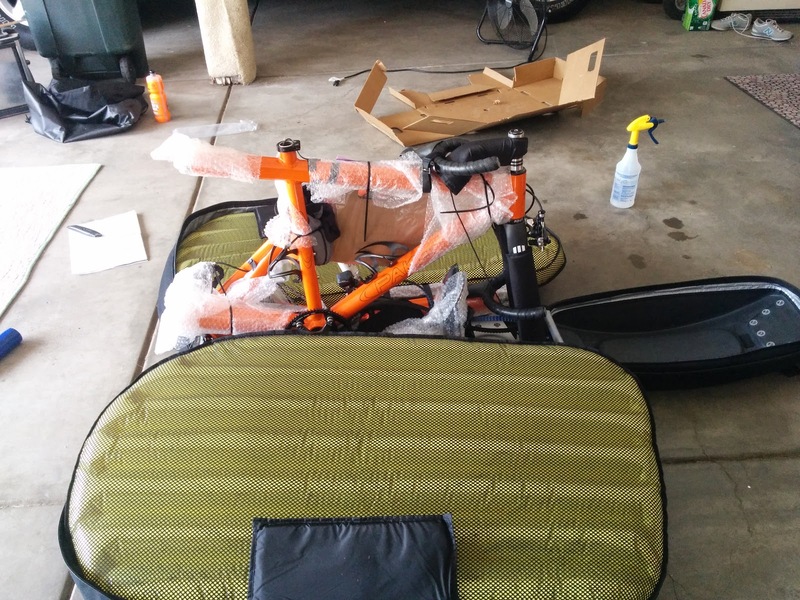 And a great benefit is the bike successfully dismantles to pack into a single bike-case, with total weight under 50 pounds (recorded 47lbs on Denver International checkin scales) which meant $zero excess charges on our maiden flight with her. Original goal of "hassle free checkin" achieved!